Whether temporary, permanent or in this context imagined, humankind has been making structures as long as we’ve existed. These structures mark time, history and memories, sometimes functional and others monumental. 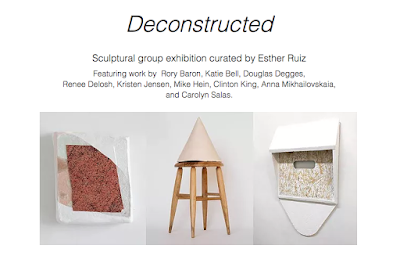 The artists in Deconstructed all employ their individual aesthetic in making their own “structures”. Borrowing likeness from household items, architecture, formalism, symbols, and found materials, these artists deconstruct preconceived elements of structure to create distinct visual languages. At times combining the familiar with the unfamiliar and juxtaposing abstraction with representation while deconstructing defined uses of material, scale and imagery. Degges alters quick snapshots of his labored paintings by zooming in and blurring them, he then prints them on canvas. Distancing the photographs and himself from the original paintings he deconstructs his own process to create fresh imagery. Delosh combines hieroglyphs, symbols, and her own studio sketches to create an imagined structure that provokes the viewer to contemplate both the importance and humor of a monument. Jensen boldly tops a wooden Dutch stool with a hand made ceramic “dunce cap” evoking caution and humor but also drawing into question the function of a stool to that of a pedestal. Commemorating fragments of material that each found surprisingly beautiful and poetic, Bell and Hein surround found wood and linoleum with odd shaped structures of foam and Plexiglas. Evoking household items and architecture, Baron and Salas eliminate color to highlight minimalist structures. A mailbox, a birdhouse, a doorway; these familiar objects are deconstructed and re-imagined as abstract forms calling into question the relationship of the body to the work. While Mikhailovskaia’s work also uses a monochrome palette, her work deconstructs preexisting notions of scale by shrinking somewhat formalist sculptures to coffee table size pieces, calling to mind the all white works of predecessor Cy Twombly but with a more playful tone. King explores, mixes and deconstructs the intellectual structures of the mind, using imagery from the depths of the subconscious and combining them to create abstract visual landscapes of the mind.